Gordon Granger (November 6, 1821 – January 10, 1876) was a career U.S. Army officer and a Union general during the American Civil War. He distinguished himself at the Battle of Chickamauga. Granger was born in Joy, Wayne County, New York, in 1821 to Gaius Granger and Catherine Taylor. He graduated from the United States Military Academy in 1845 placed thirty-fifth in the class of forty-one. He was commissioned a brevet second lieutenant and assigned to the Second Infantry Regiment stationed in Detroit, Michigan. In 1846 he transferred to the newly constituted Regiment of Mounted Riflemen at Jefferson Barracks, Missouri. During the Mexican–American War, Granger fought in Winfield Scott's army. He took part in the Siege of Veracruz, the Battle of Cerro Gordo, the Battle of Contreras, the Battle of Churubusco, and the Battle for Mexico City. Granger received two citations for gallantry and in May 1847 received his regular commission as a second lieutenant. After the war, he served on the western frontier first in Oregon, then in Texas. In 1853 he became a first lieutenant. When the Civil War started, Granger was on sick leave. He was temporarily assigned to the staff of General George B. McClellan in Ohio. After recovering, he transferred back to the Regiment of Mounted Riflemen where he was promoted to captain in May 1861. As an adjutant of General Samuel D. Sturgis he saw action at the Battle of Dug Springs and observed the Union defeat at Wilson's Creek in August 1861 in Missouri, serving as a staff officer to General Nathaniel Lyon. Granger was cited for gallantry at Wilson's Creek, became a brevet major and was made a commander of the St. Louis Arsenal. In November 1861, Granger assumed command of the 2nd Michigan Cavalry Regiment at Benton Barracks in St. Louis, becoming a colonel of volunteers. One of the Union veterans wrote in a memoir that Granger's "military genius soon asserted itself by many severe lessons to the volunteer officers and men of this regiment. He brought them up to the full standard of regulars within a period of three months," and "though a gruff appearing man, had succeeded in winning the respect of his regiment by his strict attention to all the details of making a well disciplined body of soldiers out of a mass of awkward men from every walk of life." In February 1862, on the orders of General John Pope, the 2nd Michigan proceeded from St. Louis to Commerce, Missouri, where Pope assembled near 20,000 Union troops for an advance on New Madrid, Missouri. Granger assumed command over the Third Cavalry Brigade consisting of the 2nd and the 3rd Michigan cavalry regiments. After the 7th Illinois joined the brigade, it was reorganized into a cavalry division. On March 26, 1862, Granger was promoted to brigadier general of volunteers and commanded the Cavalry Division, Army of the Mississippi during the Battle of New Madrid and the Siege of Corinth. He was promoted to major general of volunteers on September 17, 1862, and took command of the Army of Kentucky. He conducted cavalry operations in central Tennessee before his command was merged into the Army of the Cumberland, becoming the Reserve Corps. Granger is most famous for his actions commanding the Reserve Corps at the Battle of Chickamauga. 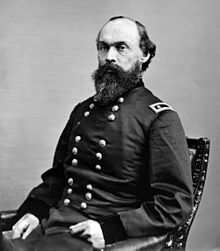 There on September 20, 1863, the second day of the battle, he reinforced, without orders, Major General George H. Thomas' XIV Corps on Snodgrass Hill by ordering James B. Steedman to send two brigades under his command to help Thomas. This action staved off the Confederate attackers until dark, permitting the Federal forces to retreat in good order and thus helping Thomas to earn the sobriquet "Rock of Chickamauga". After the battle, Granger wrote in his report, "being well convinced, judging from the sound of battle, that the enemy were pushing him [Thomas], and fearing that would not be able to resist their combined attack, I determined to go to his assistance at once." Granger's effective leadership at Chickamauga earned him command of the newly formed IV Corps in the Army of the Cumberland commanded by General Thomas, and he was promoted brevet lieutenant colonel of the U.S. Army. Under his command, the IV Corps force distinguished itself at the third Battle of Chattanooga. Two of the IV Corps' divisions, those commanded by Thomas J. Wood and Philip Sheridan, were among the units that assaulted the reinforced center of the Confederate line on top of Missionary Ridge. There, the Union forces broke through and forced the Confederates, under General Braxton Bragg, to retreat. After Chattanooga, Granger took part in lifting the siege at Knoxville, Tennessee. Despite these successes, his outspokenness and bluntness with the superiors including General Ulysses S. Grant, who disliked Granger, prevented him from gaining more prominent commands at the Eastern Theater of the American Civil War. 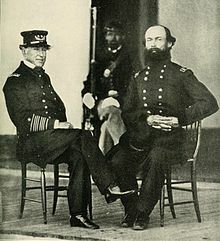 He was sent to the Department of the Gulf under General E. R. S. Canby, and commanded a division that provided land support to the naval operations conducted by Admiral David Farragut in the Gulf of Mexico. Granger led the land forces that captured Forts Gaines and Morgan in conjunction with the Union naval operations during the Battle of Mobile Bay. Granger commanded the XIII Corps during the Battle of Fort Blakeley, which led to the fall of the city of Mobile, Alabama. The people of Texas are informed that in accordance with a Proclamation from the Executive of the United States, all slaves are free. This involves an absolute equality of rights and rights of property between former masters and slaves, and the connection therefore existing between them becomes that between employer and free laborer. This set off joyous demonstrations by freedmen and originating the annual Juneteenth celebration, which commemorates the abolition of slavery in Texas. Granger remained in the Army after mustering out from volunteer service. In July 1866, he was assigned as a colonel to the reconstituted 25th Infantry Regiment. He was reassigned as colonel of the 15th Infantry, December 15, 1870. He was given command of the District of New Mexico, from April 29, 1871, to June 1, 1873. He was on sick leave of absence to October 31, 1875; and then was again in command of the District of New Mexico, October 31, 1875, to January 10, 1876. In January 10, 1876, Granger died in Santa Fe, New Mexico, where he was serving in command of the District of New Mexico. He is buried at Lexington Cemetery in Kentucky. ^ a b Eicher, p. 263. ^ Biographical register of the officers and graduates of the U.S. Military Academy at West Point, N.Y.: from its establishment, in 1802, to 1890, with the early history of the United States Military Academy / by George W. Cullum, vol. 2. Boston: Houghton, Mifflin, 1891. ^ The New York Times, August 18, 1861. ^ Mark Greenbaum. The Rock of Chickamauga, The New York Times, September 22, 2013. ^ From Texas: Important Orders by General Granger. The New York Times, July 7, 1865. ^ Gen. Gordon Granger obituary. The New York Times, 12 January 1876. ^ "Gordon Granger". Find a Grave. Retrieved August 18, 2010. Conner, Robert C. General Gordon Granger: The Savior of Chickamauga and the Man Behind 'Juneteenth'. Philadelphia: Casemate, 2013. ISBN 978-1-61200-185-2. Wikimedia Commons has media related to Gordon Granger. "Gordon Granger". Find a Grave. Retrieved August 18, 2010. This page was last edited on 4 October 2018, at 22:28 (UTC).